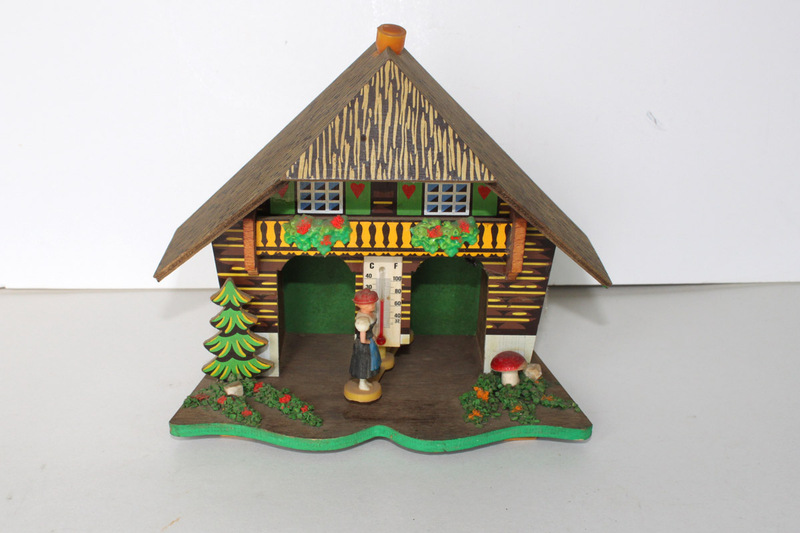 One item I found recently is this Toggili West German Weather House. I was immediately transported back to my maternal Grandmother’s house. She had something very similar in her bookcase in the living room. It is supposed to demonstrate wet or dry weather depending on which person is outside of the house. I don’t know if it still works, but I didn’t care. I spent many hours at my Grandmother’s house. When my parents would go to town to do errands, many times they would drop us off at our Grandma’s for her to watch us. This totally brought a smile to my face and made me feel 10 years old again. What has taken you back to your childhood lately? This entry was posted in Childhood Memories, Junkin' Pickin' Finds and tagged weather house by Karen Grosz. Bookmark the permalink. I recently appropriated a similar weather house that hung in my parents’ garage for years. While searching the history of these little treasures, I found your blog! I’m happy to know that I’m not the only one who has fond memories of these little wooden wonders! So glad it brought back a fantastic memory. Good luck in your search for history.